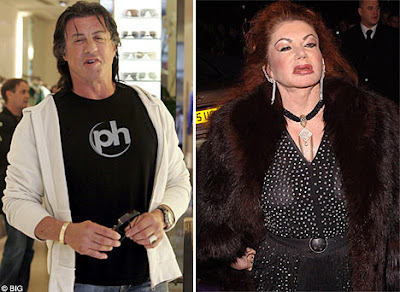 Yes, it's Sylvester Stallone and his mom, Jackie. Who is the more grotesque? Which face is the least human? Who is more likely to terrify small children and animals? I have to go with Jackie. But Sly is right on her tail...in a few years all those steroids are going to make his face explode, I predict. I don't know which one is scarier, but if I had to choose which one I'd go get a cocktail with, I'd choose the mother, and doesn't that mean she's in some way less terrifying? Happy Birthday To Felt Up! The Young And The Restless: Rehab Update! Another Celeb Might Be Pregnant. OF COURSE. World Stunned That Amy Winehouse Does Drugs! Her London Bridge Does Wanna Go Down! Nip/Tuck This In The Bud--And Pronto! Britney Loses Mind, Taken To Hospital On Gurney! First Frightening Celeb Photo of 2008!